Morgan Byers, freshman, and Baxter Krug, sophomore, celebrate that the little superman knocked over the cans. Byers and Krug were with the Honors Student Organization. The third annual Trick or Treat at the Library took place on Oct. 30, hosting all ages for games, candy and other activities. "This is our third year doing this," said Erin Johnson, Library Business Manager & Community Engagement Coordinator. "The first year we did it was pretty successful and then last year was incredibly successful so basically we just kind of keep up the momentum and keep doing it every year." Over 15 student organizations as well as friend groups volunteered to help out at the event by giving out candy to trick or treaters. "I just love Halloween, and I enjoy seeing the kids getting really into and really just having fun in a safer environment," senior Emily Krause said. "It’s really fun, you know?" Shayna Fleming, senior, said. "You remember what it’s like when you were little and going trick or treating and getting to see all the costumes." 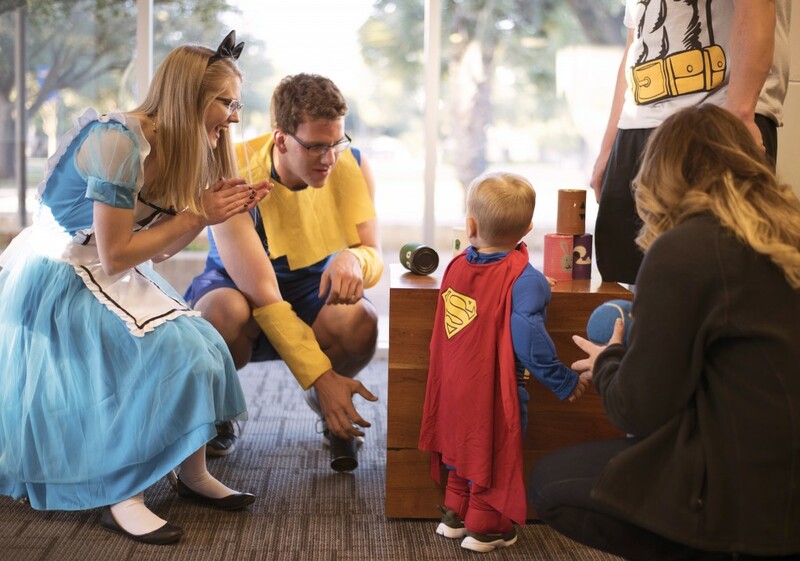 In addition to trick or treating, visitors were also able to play games such as an Angry Birds game by the Honor Students Society and tic-tac-toe courtesy of Tri Beta. "It’s been awesome," sophomore Allee Nix said. "We had a lot of kids, and we’re ready for a lot more to come. We have lots of games, and it’s just fun watching them get all excited." Student volunteers also arrived at the venue in costume where one such couple, Daniel Teague and M’Kayla Motley, juniors, went as peanut butter and jelly. Another student also came as Sakura Haruno, a character from the anime Naruto. In addition to candy donations, there were also donations for the ASU Food and Toiletry pantry. "Over at the Multicultural Center there’s actually a food pantry for students so we have toiletries, canned goods–stuff that college students like to eat," Johnson said.